Went The Day Well did his older stablemate Animal Kingdom proud by winning the G3 Spiral Stakes at Turfway Park on March 24, and Daddy Nose Best solidified his Kentucky Derby 2012 contender status with a late running victory in the G3 Sunland Derby (March 25). In other Derby prep news, Dullahan had his second setback but is still expected to make the G1 Blue Grass Stakes. He had a cough during the winter and recently missed several days of training with a splint injury No published works since 3-3 but he did gallop over the muddy main track at Gulfstream Park on 3-28. I am dropping him off my list again because he has only raced once this year with a pair of setbacks. Castaway drops off the Exciting Prospects list after dueling and fading as the favorite in the Sunland Derby. Discreet Dancer is not injured but is off the Derby trail. He will go to Ocala for some rest and is expected to resume his career later this year. G2 San Vicente hero Drill, an original member of my Kentucky Derby Top 10 list from last September, will make his next start in the G1 Blue Grass Stakes at Keeneland on April 14. G1 Norfolk hero Creative Cause, last seen landing the show in the G1 BC Juvenile, begins his road to Kentucky Derby 2012 in Sunday’s G2 San Vicente at Santa Anita Park. #2 Creative Cause (3-5) ran well in all five juvenile starts and makes his much anticipated return in this extended sprint. He captured the G1 Norfolk at Santa Anita Park last fall under today’s pilot Joel Rosario. The son of Giant’s Causeway is sitting pretty on the Derby graded earnings list and he has bigger fish to fry but seemingly does not meet much and figures to fire a big shot at miniscule odds. #5 American Act (4-1) is an intriguing contender for Jack Carava. He beat impressive next out winner Bodemeister in a local sprint Jan 16 and might get brave if able to shake loose early under Martin Pedroza. #1 Let’s Get Crackin (6-1) has been part of the Trifecta in all seven conventional dirt outings and was last seen landing the show in the local San Pedro Stakes. The obvious exotics threat projects a ground saving tactical trip (blinkers off). #4 Smoking G (8-1) looked good in hillside maiden win Jan 28. The pace player sports a bullet for this and can contend for a placing if he handles conventional dirt. #3 Drill (9-2) traded decisions with Creative Cause in the G1 Del Mar Futurity and G1 Norfolk but it has been all downhill since. He has flopped in his last four stakes outings and needs a sudden reversal of fortunes to compete here. #6 Captain Obvious (15-1) showed ability on turf/synthetic in Ireland and finished 4th after a slow beginning when last seen in the Real Quiet Stakes. He dons the hood and attracts longshot jock Gutierrez but is not bred for dirt. A single graded Kentucky Derby 2012 route prep was run over the weekend and Mr. Bowling struck out twelve rivals in Saturday’s Grade 3 Lecomte Stakes at Fair Grounds. The Lecomte did not look strong from a visual standpoint and was run in a mediocre 1:43.49. For final time comparisons, sophomore fillies covered the same distance in the Silverbulletday Stakes with Believe You Can stopping the clock in 1:42.34. Two races later, 3-year-old Atlantic Titan broke his maiden in 1:43.42. Mr. Bowling drifted out in the stretch and held off Z Dager by a head. Shared Property, breaking from post 13, rallied to finish another ½ length back in 3rd, followed by Z Dager’s stablemate Dan And Shelia. The top three are all expected back in New Orleans for the G2 Risen Star Stakes. Based on the weakness of the Lecomte, look for new shooters to make the grade in New Orleans next time. The Lecomte might not produce a legitimate Derby contender but the six and one-half furlong San Pedro Stakes at Santa Anita Park was the coming out party for Midnight Transfer. The Carla Gaines trainee, a 3-year-old son of Hard Spun, out of French Deputy mare French Satin, garnered a rock solid 93 BSF for his good looking off the pace tally on Sunday and might try two turns in the G2 San Felipe Stakes at the Great Race Place on March 10. Got Even set the pace and got nailed late by the winner. Drill made a wide early move before flattening out in yet another disappointing effort. The G1 CashCall Futurity at Hollywood Park on Dec 17 was the last major Kentucky Derby 2012 prep of the current racing season and at this point I would say that it was not a strong renewal. The road to the 2012 Kentucky Derby made a pit stop at Hollywood Park last weekend and Liaison got the job done in a professional manner for trainer Bob Baffert. The son of recently deceased sire Indian Charlie owns fine tactical speed and has a nose for the wire. He once again got the best of Rousing Sermon and the top two validated the strength of the Real Quiet Stakes. Maidens always seem to make some noise on the Derby Trail. In 2009, Make Music For Me placed behind Lookin At Lucky in a pair of graded events and graduated in a grass stakes event the following year. Santiva landed the place in the 2010 Breeders’ Futurity at Keeneland before earning his diploma in the Kentucky Jockey Club Stakes. At this point in 2011, the talented maiden award goes to Brother Francis. The son of Lion Heart, trained by James Cassidy, followed up a rallying place finish in the G3 Hollywood Prevue with a solid show finish in the CashCall Futurity. Will he return to the maiden ranks or continue to compete against stakes foes? Sky Kingdom was bumped at the start and missed the CashCall show by a ½ length. The Baffert trainee was hardly disgraced in his first start against winners and remains a decent long range prospect. Empire Way was 5th in the CashCall and should continue to improve with added ground and experience. Blingo was a nose behind him in 6th for John Shirreffs, followed by Handsome Mike (pressured throughout), Cozzetti, and a badly tailing off Drill. Majestic City attended the pace before faltering to finish 10th. He is clearly best sprinting. Basmati checked in behind him and solidified the weakness of the Delta Jackpot. The Grade 1 CashCall Futurity at Hollywood Park gives 2012 Kentucky Derby hopefuls an opportunity to earn a nice chunk of change at the end of their juvenile campaigns. Morning line favorite Majestic City has already garnered $245,570 and tries to add to his bankroll on Saturday. Trainer Peter Miller captured the CashCall Futurity last year with Comma to the Top and he is back for more with the aforementioned Majestic City. The fleet son of City Zip is 3-for-3 at Hollywood Park and recently hot Aqueduct jock Ramon Dominguez flies in for the mount. Distance is the major hurdle as he has yet to win beyond six furlongs. He removes the hood and is firing local bullets for this. Hall of Fame trainer Bob Baffert takes three cracks at the $750,000 pot and Sky Kingdom looks like an interesting contender. The $180k son of Empire Maker, out of a Kingmambo mare, figured to relish two turns and showed marked improvement on the stretch out in a sharp course/distance maiden breaker Nov 24. Garrett Gomez hops aboard and he fired a strong six furlong bullet at Santa Anita on Dec 11. Liaison shoots for his third straight win for Baffert. He looked good in the Real Quiet Stakes here last time and tries to win one for his sire Indian Charlie, who succumbed to cancer earlier this week. The third and final Baffert entrant is Drill, and the enigmatic sort exits back-to-back disappointing efforts in the G1 BC Juvenile and G3 Delta Jackpot. He is reportedly training well and both wins occurred on synthetic but he is hard to recommend in his current form. John Shirreffs rarely strikes with a first time starter but he did just that with Blingo, who rallied strongly to capture his flat mile turf bow by 2-1/4 lengths. He has the Zenyatta connections in his corner and could easily be this good. Handsome Mike drew the rail and figures to play catch me if you can under Corey Nakatani. The recent Reddam/O’Neill private purchase is on the upswing and showed high octane speed in his G3 Generous show finish at a flat mile on the turf last time. Rousing Sermon, the CalCup Juvenile winner, always runs his race and exits a place finish behind Liaison in the Real Quiet. Joe Talamo got to know the Hollendorfer trainee last time and the hard knocking CA-bred is a proven router and can make an impact at 6-1. Dale Romans has been a fixture on the Triple Crown scene in recent years and he hopes to enjoy another wild ride with Cozzetti. The juvenile son of Cozzene exits a romping maiden win in the Churchill slop and worked over Cushion Track on Dec 11. Basmati returns to SoCal after landing the place in the G3 Delta Jackpot but the number from that $1 million showcase came back light. He handles synthetic ground and must work out a trip from a tough post under profitable rider Hector Berrios. Brother Francis is still a maiden after two starts but did flash ability both times including a fine runner-up effort in the G3 Hollywood Prevue. The ambitiously placed non-winner tries two turns for the first time and is listed at 20-1 on the line. Royal Delta’s baby bro Empire Way was visually impressive in his local bow but did not earn much of a number. He came back in less than two weeks and beat one horse home in the aforementioned Hollywood Prevue. The longer the better for the stretch runner and he should continue to develop but he has not run fast enough to be competitive in this type of race. Desormais is an overseas transplant now under the care of Paddy Gallagher. He can run on day based on his ten furlong synthetic score in France on Nov 15 but landed the unlucky thirteen hole and could not have found a tougher spot for his US bow. Speaking of maidens, Groovin’ Solo finished out of the top three in both Del Mar sprint starts. The 50-1 outsider removes the hood and needs an easier spot. The unofficial road to the 2012 Kentucky Derby began with the Breeders’ Cup in early November and now that we have multiple graded routes in the books it is time to rate the quality of the preps so far. Secret Circle had every right to fold after dueling through quick splits of :20.96 and :44.55 but the Baffert trainee gamely held off overseas filly Shumoos to remain undefeated. He has route influences in his pedigree and might try two turns in the G1 CashCall Futurity at Hollywood Park on 12-17. Hansen kept his perfect record intact with a game wire job head victory. He has never been headed in three career starts and it remains to be seen how he will react to serious pace pressure. Mike Maker’s talented colt is wintering in Florida with the Gulfstream 3-year-old preps on his radar screen. Union Rags tasted defeat for the first time but was probably best after breaking 12th from post 10, racing wide, and wandering in the stretch. He is also spending the winter in Florida. Creative Cause ended his productive juvenile season with a solid show finish in the BC Juvenile. 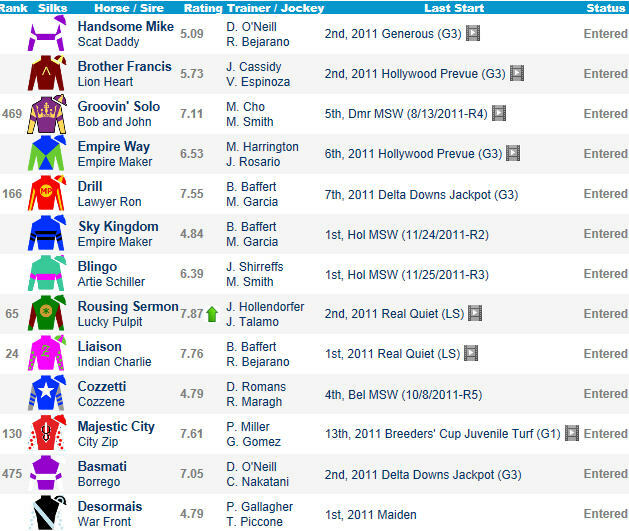 He will likely resurface at Santa Anita in 2012 with the G2 San Vicente at 7f on Feb 19 a possible starting point. Dullahan was bumped at the start and rallied to finish a respectable 4th. He graduated in the G1 Breeders’ Futurity and might be better on turf/synthetic. Liaison has now won two straight and is clearly making nice progress. He has the right connections (Baffert) and a decent pedigree (Indian Charlie-Victory Gallop). The CashCall Futurity might be next. Sabercat was making his sixth start of the year and won his third straight route in Delta Jackpot. Improving Asmussen runner breezed an easy 4f in :53 at Fair Grounds on 11-28. Basmati took six tries to break his maiden and earned a nice chunk of change in place finish at Delta Downs. The busy juvenile might show up next in the CashCall Futurity. Jerry Hollendorfer’s NoCal invader Longview Drive showed a new dimension rallying for the show. The $175k Keeneland sales grad has earned his best numbers in sprint races. Drill came back in two weeks after a failed BC Juvenile attempt and flopped once again in Louisiana for Baffert. He has dropped three straight Graded dirt routes and seemingly needs a break. Both wins occurred at Del Mar in synthetic sprints. So Brilliant was hardly as secret in his winning bow and made the betting public happy again on Thanksgiving Day. Bob Baffert’s $300k purchase is bred to route and has plenty of room to improve. CashCall Futurity is on his radar screen. Empire Way was visually impressive in his Nov 13 bow but did not earn much of a number in that event and showed nothing in his Stakes debut. He should improve next year in routes but needed to run much faster. O’Prado Again won his second straight 9f affair in the Remsen. Trainer Dale Romans has had some success in recent Triple Crown events (Paddy O’Prado, First Dude, Shackleford). Souper Speedy set the aforementioned crawling fractions and had just enough left to hold the place. Not a bad effort considering he was coming off a layoff after graduating in his 7f mud bow at 31-1. El Padrino is an interesting long term prospect. He graduated by open lengths in his second career start and saved all the ground tracking the pace while showing late interest in the Remsen. Todd Pletcher’s $210k purchase has a nice distance pedigree and plenty of room to develop. Gemologist remained unbeaten with a sharp stalk/pounce tally. Super Saver won this for same connections (Pletcher/WinStar Farm) en route to 2010 Kentucky Derby triumph. Interesting pedigree with Tiznow on top and Mr. Prospector on bottom. Ever So Lucky set the pace and gamely held the place. Souper Speedy had a similar effort/pattern in the Remsen but Ever So Lucky carved out stronger splits and looks like the better long term prospect for Jonathan Sheppard. Like the speed (Indian Charlie), stamina (Summer Squall) pedigree mix. Timely Tally has clearly kicked it up a few notches around two turns. He had some traffic issues under Borel and flew late to just miss the place. Gemologist seemingly has his number but the $220k son of Mr. Greeley is coming around and could be a player next year for Ian Wilkes.